I gave you another "A", for voting Nay on roll Call #127, the bloated 2018 Consolidated Appropriations Act. Today, I gave you an "A", for cosponsoring H.R. 367, The Hearing Protection Act of 2017 and H.R. 38, The Concealed Carry Reciprocity Act of 2017 and for voting No on H.R. 249, the bloated Supplemental Budget Bill. I gave you a grade of B. Please help the Congress to push through the acceptance of the Keystone Pipeline from Canada to the Gulf. The high prices of gasoline are outrageous! 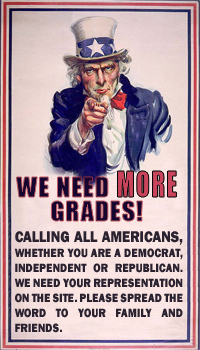 I gave you a grade of A. Keep up the good work. We are all watching and hoping. Vote as an American. God Bless! I gave you a grade of A. So far so good. Keep working for the People. Help stop the Amnesty Wreck that we don't want. Get back to the Constitution! !